Just by chance, while checking out the T-Rex, I saw a hybrid Toyota “Zipcar” parked on Burrard Street near 2nd Avenue. Beginning today [April 5th], Zipcar will place 100 vehicles in many locations throughout the Downtown, Kitsilano, Fairview, Commercial Drive and Mount Pleasant neighborhoods of Vancouver. Zipcars industry-leading selection of 11 makes and models of vehicles in Vancouver will range from standard sedans to small SUV’s and luxury vehicles. Reserve one of our hundreds of cars – for a couple hours or the entire day. Do it online or use a phone. We’re easy. Walk to the car, then just hold your Zipcard to the windshield. The doors will unlock, and it’s all yours. Drive away… and return to the same reserved parking spot at the end of your reservation. It’s that simple. And remember, gas and insurance are included too. We live on the North Shore, so it isn’t too likely we’ll be able to take advantage of Zipcar since all their cars are downtown, the West End, or Kits. And we can actually rent for cheaper than the Zipcar daily rates, but that’s only because we don’t have to pay the rental insurance rates (thanks to ICBC’s Roadstar service). But I think this will be a great option for a lot of people. 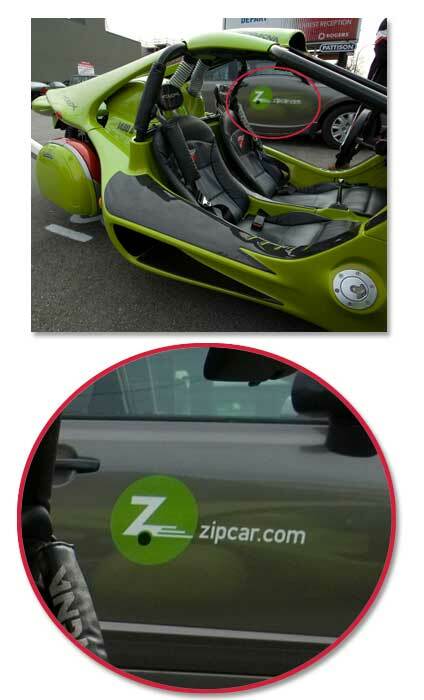 So Zipcar – welcome to Lotus Land. We recently launched a new company called Sunday that is very beneficial to Zipcar users. You can store your login details in the Sunday Portal and our team of agents can help you reserve a car real time. You can interact with them via email or phone. Use the promo code “zipcar” for a free month trial. We do a whole bunch more stuff for our customers, too.